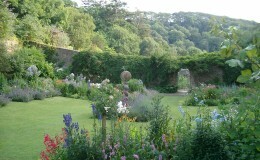 From 1157-1539 the Augustinian canons lived and gardened in this beautiful, hidden corner of North Devon. In the 18th century woodland gardens were created on either side of the Abbey with woodland walks leading to walled gardens, built to be sheltered from the worst of the Atlantic gales. In the late 19th and early 20th century Gertrude Jekyll was a frequent guest at the Abbey and was instrumental in helping Lady Stucley create the intimate paths and small terraces of the Baronet’s Bog Garden, Victorian Fernery and Camellia Garden. With the outbreak of World War I in 1914 the garden staff of 15 all but disappeared and the gardens and grounds became overgrown and virtually lost until the 1950’s when Sir Dennis and Lady Stucley, both keen and knowledgeable gardeners, with a skeleton staff, started to clear some of the Woodland Gardens and part of the Walled Gardens. They planted much of the large collection of camellias, hydrangeas and eucryphias; they cleared large areas of bamboo and replanted many rhododendrons and azaleas which were removed from Moreton House at Bideford, another Stucley home, later Grenville College. In 1996 on the death of Sheila, Lady Stucley the present owners, Hugh and Angela Stucley, started another programme of restoration. Huge areas of bramble and thick undergrowth were cleared and the Victorian Fernery, lost since 1914, re-emerged almost unscathed from almost a century of neglect. Many small Jekyll paths and terraces were uncovered. The Walled Gardens had become neglected, but in 1997 work started to remove the perennial weeds and in 1998 they were opened as an ongoing project. 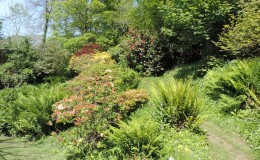 Now flourishing again, visitors will see many exciting new plantings. The woodland gardens are full of spring colour with camellias, rhododendrons, azaleas, magnolias and many bulbs all bursting into flower from Christmas onwards in this mild climate. Following these, many beautiful hydrangeas and eucryphia start flowering in July, the hydrangeas flowering well into autumn. The winding paths in the Baronet’s Bog Garden, only recently uncovered from nearly a century of neglect, lead the visitor to huge camellias, Cornish Red rhododendrons, massive gunnera, hostas, primulas, astilbe, zantedeschia (arum lilies), hydrangeas and the Victorian Fernery. A very old acer, twisted and gnarled from a century’s growth of ivy and bramble hiding it, stands at the entrance to the Fernery. The ‘Ladies Walk’ through woodland carpeted with wildflowers in spring, leads visitors to the four secret, romantic 18thC Walled Gardens. Within the shelter of the walls are grown vegetables and fruit for the house and for sale, many tender and rare plants, summer perennials and shrubs. Echium pininana, growing to 15ft in a good year, flourishes here. It had lain dormant for over ten years until the ground was worked again in 1997! 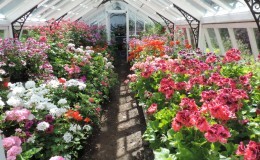 Two large glasshouses were lost in some particularly violent Atlantic gales many years ago but three remain containing tomatoes, geraniums and tender plants for the visitor to see. The gardens are once again flourishing under Head Gardener Nigel Alford’s stewardship with help from the family and are a beautiful, peaceful place to visit, almost unchanged over the centuries.